The Internet is a bountiful source of information. If you want the weather, the current exchange rate, or simply the news, you can log online and retrieve up-to-date information in a matter of seconds. Why not use the net for our own ‘knit’ purposes. 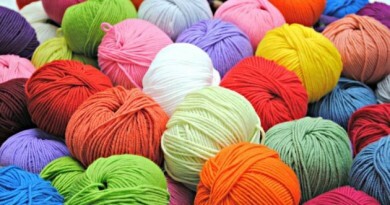 Since so much information is there for the browsing, let’s see what we can find in the line of free knitting patterns. By conducting a search using the key words knit + “stitch patterns” or knit+free+patterns on www.google.com. you can locate great sources. The following three items are a few sources I came up with. 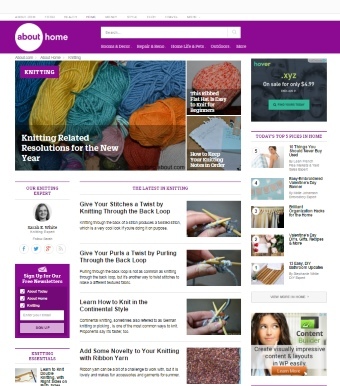 At about.com with Barbara Breiter, one can find several stitch libraries for stitch types such as reversible, lace and openwork, 2-color patterns, cables, bobbles, edgings, etc. When you click on a stitch pattern on the list, you get a visual image of a swatch and the step-by-step instructions. There are links to related sites, the stitch library listing and in some cases free patterns using the stitch pattern. At dummies.com (yes, it’s related to the ‘dummy’ series of books), you will find basic instructions on how to read a knit pattern. The information is adapted from the book Knitting for Dummies. Here, you can learn how to read a knit pattern and a knit chart. 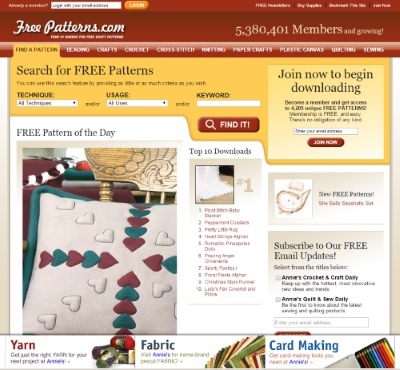 Although this site appears to be a marketing tool for various publications, you can still access an interesting library of free patterns. In order to access the patterns, you will be required to join, and provide an e-mail address. During the joining process, you are given offers to receive free newsletters and sample issues of a magazine. Read carefully. Once you have submitted your application, you will be e-mailed a password. You can then go to freepatterns.com and enter the site and request to see the free patterns. 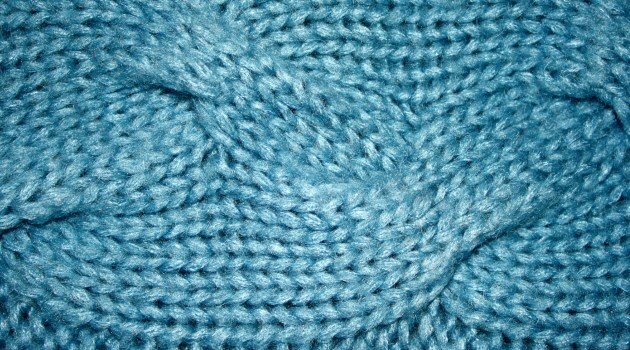 There are some nice patterns in the knitting area, and each can be downloaded as a PDF file. In my searching, I came across a group called The Free Knitting Pattern Netring. According to the owner, Chavie Fiszer, a netring is a way of linking websites that have a similar theme, and in Chavie’s case, the theme is free knitting patterns. The purpose of the netring is to allow guests to link directly to other pages of similar theme and interests. This allows you to bypass the typical weeding out of nuisance web pages. All members of the netring display a netring link on their page and this allows you to quickly get to another site with free patterns. If you like, you can request to see the links to five sites at one time. If you want to join the netring, you must own your own site and agree to the short list of rules given by the netring host. Below are a few sites on the netring, all of which have free patterns and are fun to visit. 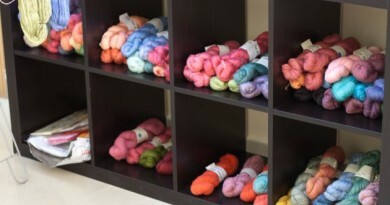 To read more about this group, go to http://www.chavie.net/knitring.html. Sarah Bradberry was born in England and now resides in Australia. Her site is great fun. There you will find a page of free patterns. All of the patterns available on this page are either owned by Sarah or she has obtained permission from the copyright owner to post the pattern. Please read her comments regarding this prior to downloading patterns so you understand how she wants people to use the designs. If you click on a link to one of her many categories, you will be taken to a directory page of patterns to view. Many have pictures of the finished garments. Illustration below shows you a sample pattern of a sweater design for her daughter. 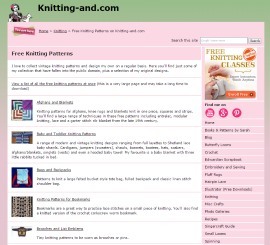 As you can see, there are numerous sites which provide stitch and design patterns for free. It is nice to know that there are people who like to share what they create. Do have fun exploring. I have an old cut-out pattern for Black Orchid Camisole from the Dec. 2007 issue of Knit ‘N Style which tells me to go to your website and download the actual pattern for free, but I can’t seem to find anyplace to enter a specific issue or pattern name. Can you help?